The largest youth campaign against Brexit hosted an extremely elaborate stunt outside Conservative Party conference this Tuesday. 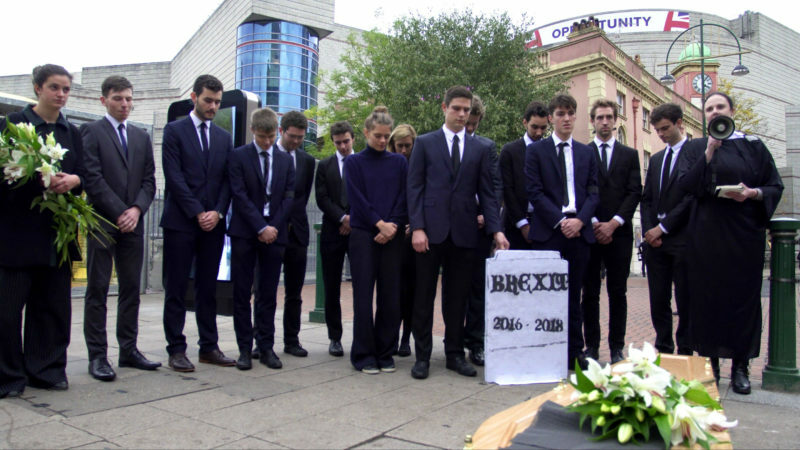 Our Future Our Choice spared no details in the Brexit Burial, with somber looking youngsters in black suits pulling a coffin symbolically containing Brexit out of a hearse. The pallbearers then brought the coffin to an area just outside the conference perimeter, to the perplexed looks of Birmingham residents. A gravestone spelling “Brexit 2016-2018” was also provided, alongside flowers and a vicar to celebrate the last rites. But what campaigners did not predict was that Conservative MP and Chief Brexiteer Jacob Rees-Mogg would walk by while they were pulling their stunt. A bemused Rees-Mogg walked passed the activists, not without the Our Future Our Choice (OFOC) founder Femi Oluwole taking a sneaky picture with the MP. “I laid Brexit to rest. Little did I know that one of this project’s forefathers would be stopping by to see the funeral rites of his political progeny. “It was great to see Mr. Rees-Mogg have to face up to the facts of Brexit’s mortality. Brexit’s two years of life were nasty, brutish, and short, and finally it has expired as a political idea. My generation realised this a long time ago. Hopefully with today’s intervention, Mr. Rees-Mogg will begin realising it too. Rees-Mogg is yet to comment on the stunt and the burial of his favourite political project.